Winship Executive Director and Chair of the Department of Radiation Oncology Walter J. Curran, Jr., MD, with endowed chair appointees Hyunsuk Shim, PhD, David Yu, MD, PhD and Xingming Deng, MD, PhD. 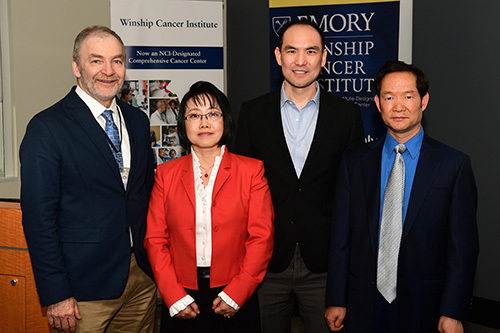 Three members of Winship Cancer Institute's Department of Radiation Oncology have been honored with endowed chair appointments in recognition and support of their outstanding contributions to Winship's cancer research. Xingming Deng, MD, PhD, is the inaugural holder of the Chair in Cancer Biology. David S. Yu, MD, PhD, is the inaugural holder of the Jerome Landry, MD Chair of Cancer Research. Hyunsuk Shim, PhD, is the inaugural holder of the Crocker Family Chair in Cancer Innovation. "Drs. Deng, Yu, and Shim provide extraordinary depth and breadth to Winship's cancer research programs," says Walter J. Curran, Jr., MD, executive director of Winship and chair of the Department of Radiation Oncology. "We are very excited to honor each of them with these distinguished endowed positions. There is no greater honor for Emory and Winship faculty than the bestowal of an endowed chair." Deng, professor in the Department of Radiation Oncology and director of the discovery theme in Winship's Discovery and Development Therapeutics Research Program, joined Winship in 2009. He has unique experience in uncovering cell death and DNA repair mechanisms. He has contributed the understanding of the Bcl-2 and Bax family of proteins and how their anti and pro-apoptotic functions influence the development of aerodigestive malignancies and their subsequent response to anticancer therapies. He has obtained four patents for new anticancer drug discovery. Yu, associate professor and director of cancer biology in the Department of Radiation Oncology, began his faculty career at Winship in 2010. His research focuses on the role of acetylation in directing the replication stress response and whether it will translate to cancer therapeutics and diagnostics, especially for patients with pancreatic cancer. In 2014, Yu received the Michael Fry Research Award from the Radiation Research Society recognizing the most outstanding junior scientist in the field of radiation research. Shim, professor and scientific director of medical physics in the Department of Radiation Oncology, is a molecular oncologist with a specialty in diagnostic imaging and drug discovery. In her 16 years at Emory and Winship, she has contributed groundbreaking insights into the involvement of chemokine receptor modulation in cancer invasion and metastasis. She is known as a global expert in working with the alpha chemokine receptor CXCR4. Shim leads Emory's National Cancer Institute Quantitative Imaging Network team on developing advanced 3D whole-brain spectroscopic MRI for the management of brain tumor patients.